Beyond Fitness offers INTENSIVE BARRE CERTIFICATION, PILATES ANATOMY and a PILATES INSTRUCTOR MENTORING PROGRAM. Love your work as much as your workout! Everyone knows Barre Classes are fun, challenging and effective, but not all barre classes are also therapeutic. After years of working with students who got injured taking other barre classes, physical therapist Caryn Connarton created a program that would train teachers to teach the type of Barre Class offered at Beyond Fitness Pilates Studio: fun, challenging, effective, AND safe (even secretly therapeutic). You want people coming to your classes for the fun and intensity but leaving your class with knees/ hips/ necks that feel better then they did before class, not worse! Usually Barre Props, Pre-and Post-Natal Exercise, and Injury and Special Health Conditions Modifications are taught as advanced instructor workshops, but since this knowledge is essential to safe teaching, we’ve included it all in this inclusive intensive workshop. 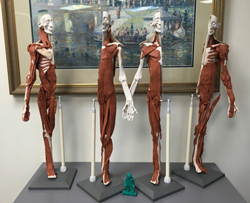 Pre-requisites to Certification: College level Anatomy or our Pilates Anatomy using Anatomy in Clay Systems Course. 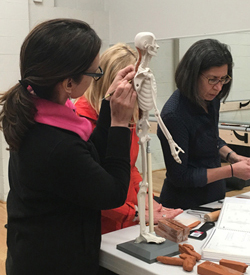 Since we are offering our Pilates Anatomy using Anatomy in Clay Systems Course after the Barre Certification, you can take our Pilates Anatomy Course after this course. However, you will not be officially certified without proof of Anatomy Training. Course Fee: $1000 course fee includes the course, 10 practice classes (to be scheduled at a later time), test date, and the course manual. Use the link below to pay for the class then reserve your spot online for just the first date. You will then be automatically be registered for the other dates. Reserve Your Barre Certification Spot Here! Anatomy is endlessly fascinating and can be really quite fun! This hands-on Pilates Anatomy Course will teach you all about the bones, joints, major muscles and soft tissues of the human body. You will learn exactly where all the major muscles attach by molding and attaching the clay "muscles" to the model skeletons yourself. Doing so leads to a better understanding of each muscles action and also it’s potential for injury. Creating the models yourself will imprint the information in your brain in a way learning from a book just can't do. We will learn how to locate these muscles ourselves with some rolling and pilates reformer breaks. Postural analysis will also be covered. This course will be appropriate for those with or without previous anatomy training and can be used as a pre-requisite for Pilates, Barre, Yoga or Fitness Instructor Training. Use the link below to pay for the course, then reserve your spot just for the first date online. You will then automatically be enrolled in the other date(s). Class limited to 8 students, so if you are interested but are waiting to register, e-mail Caryn asap! Course Fee: $550 plus the cost of the course book available here on Amazon. Reserve Your Pilates Anatomy Spot Here! Licensed physical therapist and certified pilates instructor Caryn Connarton has been integrating pilates and physical therapy for 16+ years. She offers mentoring for new and experienced instructors specialized by request.